Alcoholism: What Does the Brain Have to do With It? This entry was posted in Substance Abuse on April 11, 2014 by Platinum. On the surface, alcoholism may appear to be a desperate measure for surviving life, an escape from overwhelming circumstances, or an indulgence taken beyond control. However, alcoholism is much more than the many stigmas make it out to be. Alcoholism is a severe mental illness that is chronic and progressive by nature. Numerous consequences result from alcoholism that negatively impact a person’s physical, emotional, and social well being. In fact, alcoholism has become an economic and global burden. Just in the United States alone, almost 80,000 people die each year from alcohol-related causes, making it the third leading preventable cause of death in our country [1, 2]. The issue of alcohol use disorders impacts Americans across our country, whether drinking is directly involved or not. The United States has spent over $200 billion annually on alcohol-related problems, including lost productivity, health care, and property damage costs . Globally, alcohol use is the leading risk factor for premature death and disability among individuals between the ages of 15 – 49 . Alcoholism clearly warrants the attention of greater strategies for understanding, education, prevention, and treatment measures. As alcoholism and alcohol related issues become a public health concern, research has turned its attention to this crippling disorder. A recent study from the University of Utah Health Sciences has investigated possible biological factors that may influence alcoholism. Neuroscientists studied the region of the brain called the Lateral Habenula, which may play a crucial role in the process of decision making. In normal individuals, this region of the brain is activated by bad experiences, influencing how well an individual may learn from these situations. Scientists have suggested that this region of the brain may regulate how badly an individual feels after over-drinking. In response to the symptoms of over-drinking, such as nausea, incoherence, etc, many people would typically stop drinking. However, individuals with alcoholism will continue to escalate their alcohol intake, even when feeling the physical symptoms of over-drinking. In an experiment conducted on rats, scientists found that by inactivating the lateral habenula region of the brain, the rats drank more heavily than control rats and escalated their alcohol drinking more rapidly . The rats were given intermittent access to solution of 20% alcohol over several weeks. 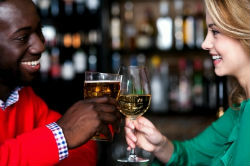 Co-first author of the study, Andrew Haack, noted, “The way I look at it is the rewarding effects of drinking alcohol compete with the aversive effects. When you take the aversive effects away, which is what we did when we inactivated the lateral habenula, the rewarding effects gain more purchase, and so it drives up drinking behavior.” These findings may be significant in that they help explain why individuals may be less sensitive to the negative effects of alcohol. Understanding the biological component of mental illnesses is helping to improve treatment measures and prevention strategies. While alcoholism is also influenced by psychological and environmental factors, learning about the biological component gives greater understanding to addiction. : Centers for Disease Control and Prevention (CDC). Alcohol-attributable deaths and years of potential life lost—United States, 2001. MMWR Morb Mortal Wkly Rep 2004; 53(37);866-870.
: Mokdad et al. Actual causes of death in the United States, 2000. JAMA, 291:1238–1245, 2004.
: Bouchery et al. Economic costs of excessive alcohol consumption in the U.S., 2006. Am J Prev Med, 41: 516-524, 2011.
: Lim et al. A comparative risk assessment of burden of disease and injury attributable to 67 risk factors and risk factor clusters in 21 regions, 1990-2010: a systematic analysis for the Global Burden of Disease Study 2010.